What is the Best Electric Snow Blower of 2019? The Toro 38381 18-inch Electric Snow Blower is the best electric snow blower you can buy for the value it provides. It’s a wonderful feeling when it snows. It feels like the festive season is just around the corner. But all that snow means you need to clean it up. You need to get it out of your driveway, walkways, patio, and decks. A shovel can help you get rid of a few inches of snow. But if you live in an area that gets a lot of snow, a snow blower can get the job done fast and with little effort. Let’s take a look at the best electric snow blower you can buy that helps take care of the snow in your yard. Do you need an electric snow blower? A snow blower is a tool that helps you move snow with the help of an auger. It clears the path and throws the snow to another area. It’s useful to move away drifts of snow that are about a foot deep. The tool helps you avoid the backbreaking work of using a shovel. And it saves you money from paying for a snow service. You can get a snow blower that works with gas or electricity. The electric ones could be corded or cordless. The gas snow blower is more powerful than an electric one. But they need more maintenance, are difficult to operate, and expensive. They also make a lot of noise and release emissions. A corded snow blower runs when you plug it into a power socket. They’re inexpensive, easy to use, and maintain. But they’re limited in range by the outdoor extension cord you use. And they’re a lot less powerful than a gas snow blower. A cordless snow blower is one that runs on a rechargeable battery. They’re a bit expensive compared to a corded one. They have a good range working in the yard but are less powerful than a gas snow blower. The electric snow blowers don’t have the problem of noise and emissions as a gas powered one. The single stage snow blower has an auger that picks up the snow and pushes it through the chute. It’s useful to remove snow from shorter, more level areas like driveways, walkways, and decks with 6 inches of snow. The two stage snow blower has an auger to pick up the snow and an impeller to push it through the chute. This gives it more power to clean up to 16 inches of snow. The two stage snow blower is useful to clear out snow on land with gravel and rocks. They tend to be heavier, expensive, and difficult to use than a single stage one. There are a few snow blowers that are three stage with an auger to pick up the snow, an impeller to discharge through the chute, and an accelerator to speed up the process. They’re the most expensive ones and need a lot more maintenance after use. If you just get a few inches of snow every year, a shovel is all you need to get rid of it. But if the snow is about a foot or more deep, a snow blower can help you. It’ll save you the time and the hard work that it takes to move this snow. If the snow is wet or more than a foot, you’ll need more power and a gas snow blower would be a good choice. But for dry snow and a few inches of it, an electric snow blower is the best choice because it’s inexpensive, easy to use, and maintain. There are certain factors that can help you make the best buying decision for the electric snow blower. The electric snow blower could be corded or cordless. The corded one works with plugging into a power socket. You need an outdoor extension cord that is long enough for moving around in the yard. If you need more range, a cordless snow blower that runs on battery power is a good choice. But it tends to be a bit more expensive and heavier than a corded one. You may be able to choose a single stage or two stage type of snow blower. The single stage is inexpensive and easy to use compared to the two stage one. But if you need a bit more power, the two stage should be your choice. The power of the electric snow blower is measured in Amps for corded and Volts for battery powered ones. The higher the power, the better the performance of the snow blower. But this also increases the price. You should check how much snow the blower can move per minute. It could range from 500 lbs to 700 lbs per minute. The design of the electric snow blower helps to figure out how efficient it can be when moving snow. You should check the clearance width that shows how wide the snow blower works. And the intake height of now much snow it can pull. Take a look at how far the snow blower can throw the snow which could range from 15 to 30 feet. The electric snow blowers are easier to maneuver than gas powered ones. But check how comfortable you are using the one of your choice. They have 6-inch or 7-inch wheels that help move it better around the yard. The weight of the snow blower helps as well. The lighter the snow blower the better it is to move around. Some snow blowers come with a self-propulsion mechanism so you don’t need to do much work moving them around. It’s good to choose an electric snow blower that has simple controls. You want them to be well within your reach when using. Make sure to get one with an adjustable discharge chute so you can rotate it around and throw the snow in the required direction. Some snow blowers come with a headlight that makes it easy to use in dark conditions or even at night. An electric snow blower is not an expensive equipment as compared to a gas powered one. But you want to get one that works for a long time before it needs a replacement. Check how durable the electric snow blower is before buying one. Many come with plastic parts including the auger. They tend to be made with durable plastic but if you can get one with metal, it’’ll last even longer. The weight of the electric snow blower determines how easy it is to move around and store when not in use. It’s good to get a snow blower that is as lightweight as possible. But if you can get one with good quality, this should not be the only deciding factor. An electric snow blower is inexpensive compared to the gas powered ones. But the price could vary based on the quality of the tool. We recommend to pick the best quality electric snow blower you can get. It’ll last a long time with little maintenance and give you a good performance. The warranty of the electric snow blower gives you confidence when using it. You know if something goes wrong, the company is there to help you out. The electric snow blowers could come with a warranty that ranges from two years to four years. Make sure to read the manufacturer’s instruction manual before using the snow blower. It’ll show you how to assemble, use, and maintain the tool. Wear the right safety gear before using the snow blower. You want to protect your eyes from the debris by using safety goggles. Wear long sleeves shirt and pants to protect your body from the debris. Don’t wear loose clothes that could get sucked into the snow blower. Be careful where you aim the chute so the snow does not fall on other people. Make sure to stop the snow blower before you try to clean it. Don’t use your hands but the clear-out tool that you get with the snow blower. Check the parts of the snow blower for damage. This includes the shear pins, auger, scraper blades, battery, or power cord. Before using the electric snow blower, clear the area of things like large rocks, debris, and kids toys. It’s good to make a plan of how you’ll clear the path. If it’s a corded snow blower, connect it to a power socket. Use a good outdoor extension cord you can use in the winter. If it’s a cordless snow blower, make sure the battery is fully charged before starting the blower. When using the snow blower, move at a slow and steady pace always in control of the tool. Use the snow blower in the direction of the wind, so the snow does not blow on to your face. You want to start from the house and move in an outward direction. You may need to do a few rounds to get all the snow cleared from the area. The electric snow blower does not need as much maintenance as a gas powered one. There are just a few things to inspect. Check whether there are any loose parts. Make sure the scraper blade, auger, and cables are not worn out. If so, you need to get them replaced. Check that the power cord is functional and not suffering from damage. It might be good to spray silicone lubricant on the body of the electric snow blower so it’s easy to slide and cut the snow. When you’ve finished clearing the snow, clean the blades, auger, and impeller from any debris like ice and rocks. You should use the clean-out tool that comes with the blower to clear the chute as well. The Toro 38381 is an electric snow blower that can move up to 700 lbs of snow per minute. This is great when you want to clear snow from walkways, patios, decks, and small driveways. The motor is a 15 Amp one that comes with an 18-inch clearance width and 12-inch intake height that gives you fast clearing. It can throw snow up to 30 feet away. Though it’s better to do short passes than long ones with this snow blower. The chute can be adjusted around a 160-degree angle so you can direct the snow in the required direction. The WEN 5662 snow thrower comes with a 13.5-Amp electric motor. This is powerful enough to throw up to 490 lbs of snow per minute. The thrower can clear snow 18 inches wide and 7.8 inches deep. And it can throw the snow away up to 20 feet. It comes with 6-inch wheels that can make it easy to move around the yard. The frame is collapsable which makes it easy to store away. The snow thrower weighs 32 lbs which makes it decent to move around the yard without fatigue. The chute can be adjusted to rotate 180 degrees so you can control the direction to throw the snow. The Snow Joe Ultra SJ623E comes with a powerful 15-Amp motor that can move up to 720 lbs of snow per minute. This makes it suitable for clearing snow off mid to large sized driveways and walkways. 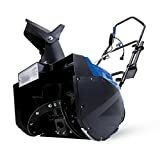 The 4-blade steel auger can help you cut snow up to 18 inches wide and 10 inches deep in a single pass. The chute can be adjusted to 180 degrees so you can control the direction of throwing the snow. This can throw snow up to 25 feet away. The Snow Joe Ultra SJ623E comes with an on-board 20W halogen headlight so you can also work at night. This snow thrower weighs 33.7 lbs which makes it good to maneuver in the yard or driveway without fatigue. The Snow Joe Ultra SJ623E comes with a full two-year warranty. So you can be comfortable using this tool without worrying about it breaking down. The Earthwise SN74018 is a cordless snow thrower that comes with a 40V brushless motor. This helps you get the best performance and durability. It can move about 500 lbs of snow per minute. This is good for clearing off snow from your driveway, pathways, decks, and patios. You can get a clearing width of 18 inches and a clearing depth of 12 inches with this tool. And it can throw the dry snow up to a distance of 30 feet. The handle is ergonomic which makes it comfortable to use. It has 2 LED spotlights that make it handy to use in the dark or at night. It comes with 6-inch rear wheels but they could have been bigger to help cut through the snow even better. The Earthwise SN74018 weighs about 35 lbs which makes it good enough to use for a while before feeling fatigue. This tool comes with a limited two-years warranty against manufacturing defects. The Greenworks 2600502 is a corded snow thrower that comes with a 13-Amp electric motor. This should be good enough to clear the snow from your driveway, walkways, patios, and decks. The chute can be adjusted to 180 degrees so you can control the direction where to throw the snow. You can get a clearing width of 20-inch with this snow thrower. This snow thrower can throw snow up to 20 feet. It has 7-inch wheels which help you maneuver it while cutting through the snow. The Greenworks 2600502 weighs about 32 lbs which makes it good enough to use for a long time without fatigue. The handles can be folded so it turns compact to store it away. You can get a model that comes with an LED light that helps you move snow in the dark or at night. The Greenworks 2600502 comes with a limited four-year warranty which is the longest you can get in our list. The Toro 38381 18-inch Electric Snow Blower is the best electric snow blower that’ll help keep your yard free from snow. It has a 15-Amp motor that can give you a good performance and moves snow up to 700 lbs per minute. The 18-inch clearance width and 12-inch intake will help get the job done efficient and fast. It’s nice to have the Power Curve technology that’ll help you get the snow cleared without clogging the chute. It’s a nice lightweight snow blower to have to clear the yard and store it away when not in use.